^ "IMDB". 1 June 2015. ^ Lim, Dennis (2 April 2015). 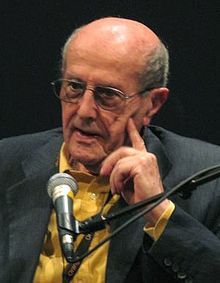 "Manoel de Oliveira, Pensive Filmmaker Who Made Up for Lost Time, Is Dead at 106". The New York Times. Retrieved 3 April 2015. This page is based on the Wikipedia article Manoel de Oliveira; it is used under the Creative Commons Attribution-ShareAlike 3.0 Unported License (CC-BY-SA). You may redistribute it, verbatim or modified, providing that you comply with the terms of the CC-BY-SA.